Sygic FleetWork API allows you to connect your or third party systems to Sygic FleetWork. All functions may be used directly from your system as well as all information may be send back from Sygic FleetWork to your system. This way you can use your system instead of FleetWork web portal. To be able to integrate your system with FleetWork, you need to generate your own API key first. Once you have generated it, you can use the interactive help. For any operation with API key, you have to be signed in to the Sygic FleetWork (https://www.fleetwork.com). If you don’t have an account, you can create one for free. Your new API key is created. You might generate as many API keys as you like. Multiple API keys can be used e.g. to differentiate users who created the calls. 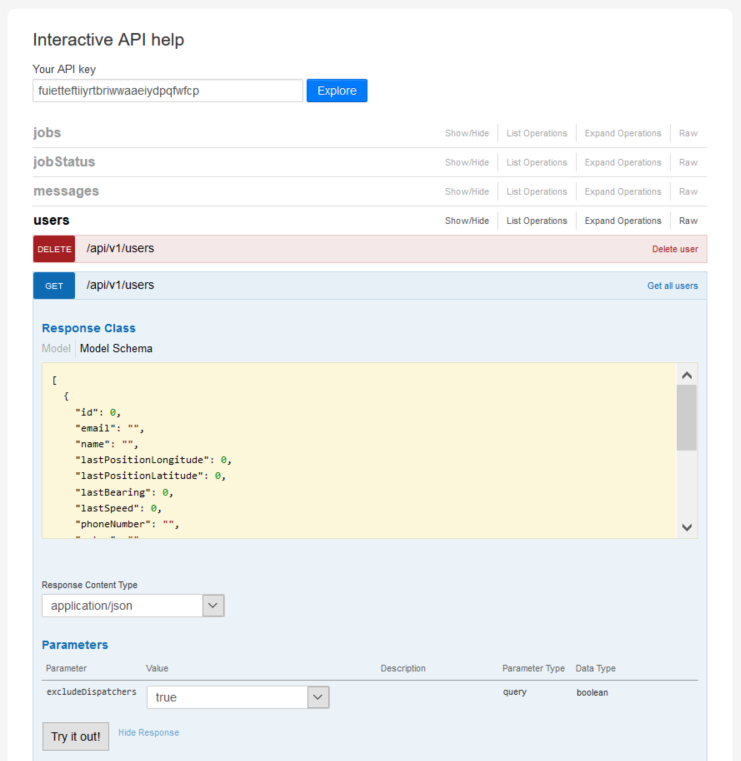 Click Try out next to the API key to open an interactive API documentation, where you can call all API methods. To delete your API key press Delete API key button next to the key you want to delete. Purpose of this document is to navigate you to online interactive help, which describes all API features. Click this link to open an interactive API documentation. In this case you need to paste your API key into the text box API key and click Explore to be able to try out the methods. 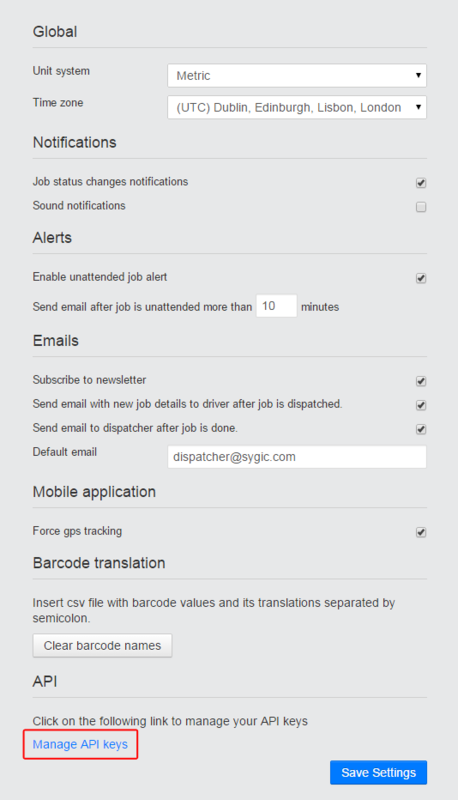 As an example call, we will use easy method for getting all drivers in your organization. Paste your API key in Your API key field to be able to try the methods with your account data. You can see Request URL. This is the URL you have to call from your application to obtain the result. As you can see, it contains your API key too. 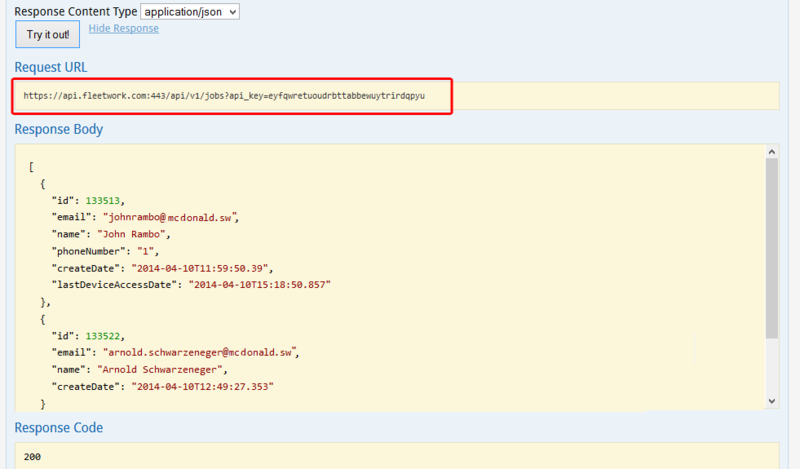 Response Body is data you’ve requested in JSON format, in this case all drivers in your organization. Response code 200 means everything went fine. All response codes are described in a table below. You may use 2 ways how to call API. Don’t forget to use your API key. Response consists of Response body, Response code and Response Headers. Response Body is usually data you requested in JSON format. Response Code tells you whether your API call was sucessful and what went wrong. Response Header defines the format of the data. 200 OK – Everything is OK.
204 OK – Everything is OK . Server is not sending any data. This is response is used after deleting an entity. 400 BadRequest – Invalid input or no API key inserted. 401 Unauthorized – Wrong API key or you are not authorized to use API. 404 NotFound – Entity wasn’t found.